The plum is a stone fruit, rounded or elongated that can be yellow, green, red or purple. In general, it is very nutritious and rich in vitamins, specially vitamin C. It is more or less juicy depending on its water content. Prunes or dehydrated plums are preserved for longer time and are very sweet. In the market there are other products processed with plums, such as jams, juices and liquors. The plum is an important source of vitamins and other nutrients with healthy benefits. Thanks to their vitamin C content it prevents several types of cancer. Plums are very energetic and rich in fiber, for which they are recommended to sportsmen and as laxatives. Plums can be consumed fresh as dessert or they can also be used to make stuffed pies, jam, jelly, juice, liquors, etc. Some species dry up without fermentation, like prunes, of which we can find some types in the market which are less dehydrated, with a very pleasant flavour. 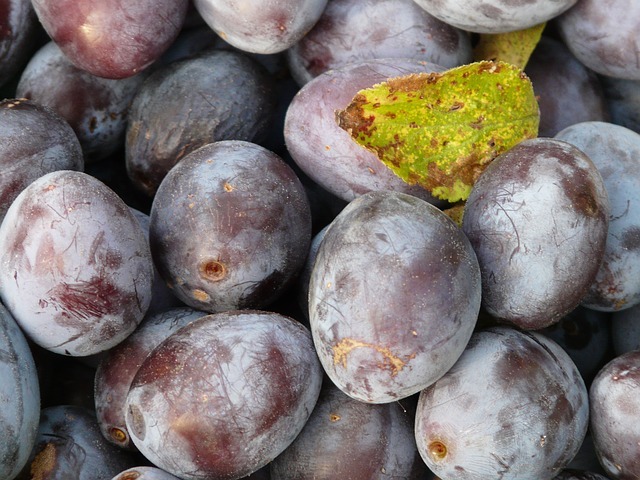 Prunes are preserved longer than fresh plums. It is a very energetic food, since it has between 36 and 52kcal/100g. Moreover, one hundred grams contribute to 5mg of vitamin C.
The plum, along with the peach, the pear and the almond, belongs to the family of the Rosaceous and the Prunus genus, which includes some trees and shrubs that are purely ornamental. The structure of all fruits belonging to the Prunus genus is, in fact, similar to the individual fruits of blackberries or raspberries; the inner stone is the hardest part of the ovary, and the most fleshy part is the external layer of the ovary. The seed is inside the bone. Botanists refer to these fruits as " stone fruits’. Only the seed or almond of the sweet almond tree is normally eaten; the almond of other fruits of the Prunus genus is usually bitter, so it is thrown away. There are different varieties of plum. They can be round or elongated, with different flavours and colours, yellow, green, red or purple and they vary in size and texture. Their water content also varies, as well as the different uses of each variety. The harvest takes place from mid June until August, although there may be an earlier harvest for some precocious varieties and in certain places. Plums can be conserved in cold storage rooms for a time and a useful practice, which is still not widespread, is pre-cooling. It is a caducifolious fruit tree called plum tree, that can reach 10m high. The flowers are white and have five petals. When they are totally flowered they are very beautiful. The plum belongs to the family of the Rosaceous and comes from a fruit tree that, in some species, reaches between 6 and 10 meters high, although a tree of medium size reaches a maximum height of 5-6m. The trunk’s bark is bluish- brown, bright, smooth or cracked longitudinally. It produces alternat, small, thin branches, sometimes smooth, glabrous and other times pubescent and hairy. Its root system is formed by long, strong, folding, winding roots, slightly branched and not very deep, frequently bearing shoots. It is a caducifolious tree, with oblong, sawed and green leaves, smooth on the upperside and pubescent on the reverse . The flowers appear in one year old small short branches. They are white, solitary, with shorter peduncles than those of the cherry tree flowers, pubescent , flattened and with small buds of rough scales. They have a thalamus in the crown; in its edge the sepals, petals and stamens are inserted, whilst at bottom, the ovary is inserted. There are 5 sepals; the 5 petals alternate with them, they are free, narrowed in the base and with a waved edge. There are many stamens, with bilobed anthers. The ovary is oval and containing two ovums in a single cavity. The fruit is a round or oval drupe covered with a whitish wax (pruin), yellow, red or purple, with an average peduncle, hairy, oblong, compressed and slightly rough stone; one of the sides has only one rib. Inside the bone there are two seeds or, more frequently, a single one, because the other has had an abortion. After a month, the seeds lose their germination capacity.